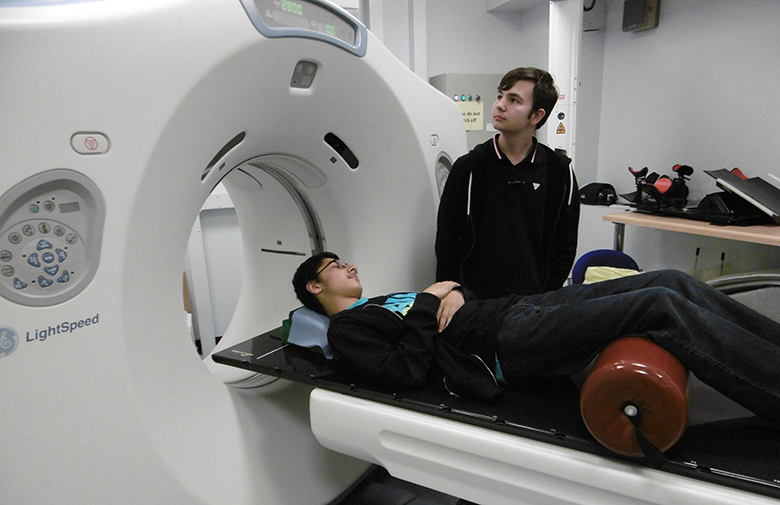 Aspiring Medical students at The Sixth Form College, Solihull got their hands on some state-of-the-art radiotherapy equipment last week as they attended a Radiotherapy Taster Day at the University of Liverpool. The A level students, who are all part of the College’s Pre-Medical School enrichment, visited the university to get an idea about what a career in radiotherapy would involve. They got hands-on experience with some state-of-the-art, hi-tech equipment, such as a CT scanner, Eclipse planning system and VERT 3D linear accelerator. Although the event wasn’t strictly directed at students wanting to study medicine, it gave them a detailed insight into methods used for the diagnosis and treatment of many kinds of cancer. It also gave them greater awareness of other possible healthcare career routes. This trip was also an opportunity for the students to visit a high performing Russell Group university and they had time for a tour of the campus. Visits like this form a major part of the Pre-Medical School, which is a specialist enrichment offered by the College and geared towards students who are looking to pursue careers in Medicine. As well as the Pre-Medical School, the College offers other specialist enrichments and boasts many links with HE institutions. This includes a Shakespeare Academy for English students, a Psychology Research School, an Engineering Academy and specialist academies in Business, Law, Politics, Economics and Sociology. These academies are all aimed at ensuring our students have the best possible chance to getting offers from some of the most prestigious and highly-sought-after universities in the country.